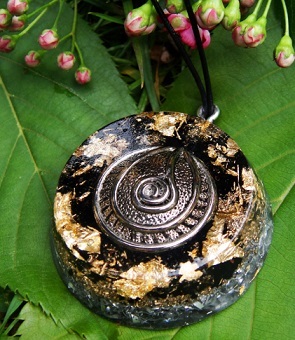 Black tourmaline orgonite is powerfully grounding, and enhances the ability of orgonite to protect against the effects of EMF, since black tourmaline in itself is the best crystal to use against EMF (don’t forget that orgonite highly magnifies the power of any crystal embedded within it). Black tourmaline is good to use against energy that feels scattered and disconnected, since it is a grounding root chakra stone. It is also very good at repelling any kind of negative energy – probably one of the best stones for this cause. 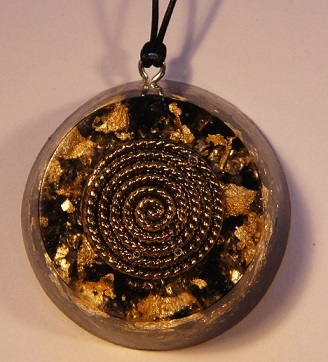 If you are feeling sensitive to negative energy around you, it’s a good idea to wear a black tourmaline orgonite pendant. Furthermore, black tourmaline is a very good stone for helping you deal with stress and crisis. It helps strengthen your immune system and can even help with pain relief. It can be used to soothe panic attacks and increase confidence. Black tourmaline orgonite pendants can provide protection during shamanic work, or other rituals where you might need extra protection. It is also a good stone to use when meditating or doing healing work. 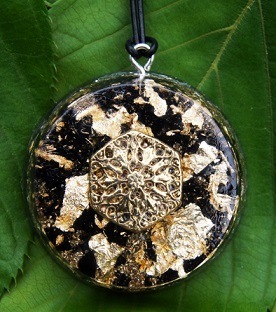 Healers tend to come in contact with other people’s negative or stagnant energy often, and while most healers are careful to ground and centre themselves while doing healing work, a black tourmaline orgonite pendant can provide extra protection against picking up on other people’s negative energy, as well as grounding the healer to make the healing more effective. If you want to buy a black tourmaline orgonite pendant, including the ones pictured on this page, head over to the black tourmaline orgonite section on the Orgonise Yourself Store.